In 2017, the NCCHPP published an extensive literature review on a group of political actors that are often overlooked: the advisors of policy makers. This analysis included numerous verbatim statements made by the advisors themselves, full bibliographic references, and key considerations in terms of knowledge sharing. A new summary of this literature review is now available: Knowledge sharing and public policy series - Policy makers' advisors, scientific knowledge and knowledge sharing: highlights of a literature review and key lessons. This summary outlines highlights of the analysis and key considerations for public health actors hoping to share knowledge with policy makers' advisors. 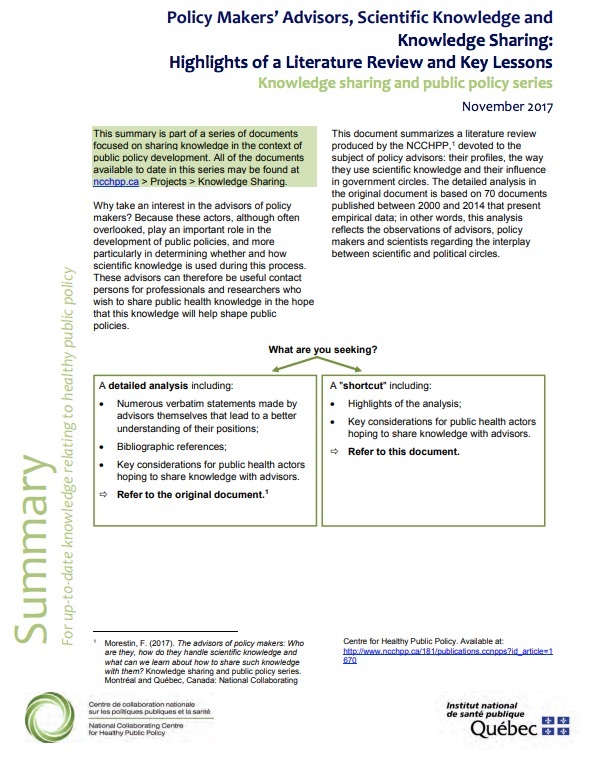 These documents are part of a series focused on knowledge sharing in the context of public policy development. To learn, visit the NCCHPP website. To stay informed of the release of future documents in this series, subscribe to the NCCHPP Knowledge Sharing and Public Policy distribution list.